The 3-day comprehensive professional development course delivered by Coerver Coaching Netherlands ends Wednesday, July 12, in Lagos. 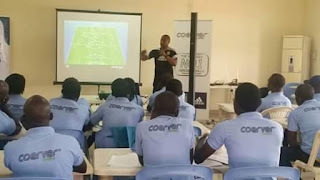 Facilitated by Search and Groom youth for development centre, the course had 80 young coaches from schools, churches and academies from both Lagos and Abuja go through an intensive football coaching course in youth football development. Instructors from Coerver Coaching Netherlannd have used the last two days to drill the participants in both theory and practical sessions at the Lagos preparatory School, Ikoyi, while the final day will avail the participants the opportunity to put into practice what they have learnt through the use of school children to create a game time situation that will test their assimilation and evaluate their understanding of the course. CEO and Technical Director Coerver Coaching Netherlands, Rainel Woerdings, expressed satisfaction with the enthusiasm displayed by participants. “They have shown enthusiasm to learn which is evident in the kind of questions they ask. “We will be able to see those among them that will do well in coaching as they put to use what they have learnt with the children during the practical session, on Wednesday,” he said. The youth football coaching diploma 1 course which is held in the last three days is tailored to take care of players between ages 7-16 years.